Angelicas and Montuno Productions present, Jeff Sanford’s Cartoon Jazz Septet, in a live performance of the delightful and whimsical music of the classic cartoons. The Septet is a smaller version of the Cartoon Jazz Orchestra, which Jeff Sanford organized in 2003 to play the eccentric, highly entertaining and challenging music of American composer Raymond Scott. This music is known to millions around the world—it was the soundtrack to 120 classic Warner Bros. Looney Tunes cartoons. The first public appearance of the Cartoon Jazz Orchestra was at the 2003 Stanford Jazz Festival, and the group has been performing regularly ever since. They appeal to young children who love the great variety of instruments and sounds, older adults who remember the original cartoons, and music lovers of all ages who appreciate the sophisticated, out-of-the-box compositions and performances. Audiences everywhere are blown away by their virtuosity. And the musicians have as good a time as the audience does. The vision of the Septet extends far beyond Raymond Scott’s music these days. Among other icons, Jelly Roll Morton and Duke Ellington are represented, as is Charlie Shavers, the brilliant trumpeter, composer and arranger who “jazzed the classics” for the John Kirby Sextet in the 1930s. Since 2009, Lenny Carlson has been composer-in-residence for both the Septet and the Orchestra, composing more than 30 original pieces in a variety of styles. Lenny has taken the spirit of Raymond Scott and updated it, combining classical and jazz elements with klezmer and folk styles from around the world. He has also composed a number of Latin-flavored pieces that are part of the Cartoon Jazz Septet repertoire. 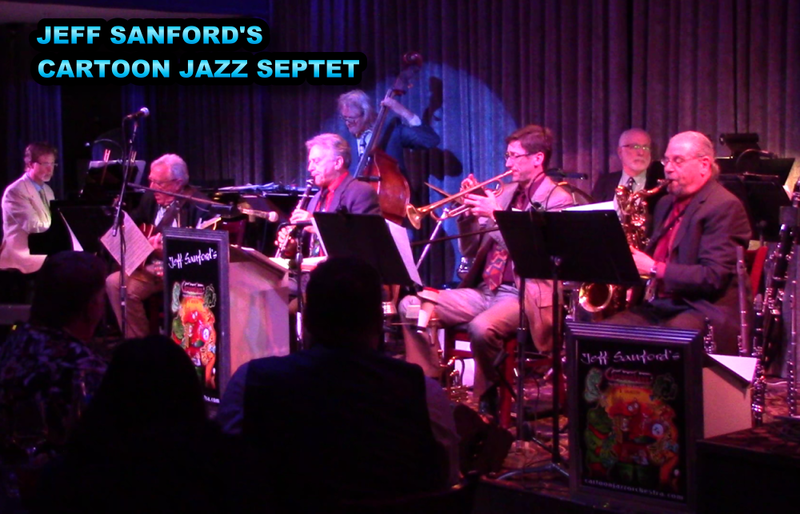 "Jeff Sanford's septet has won fans around the Bay Area with its high-spirited renditions of classics by Raymond Scott, Jelly Roll Morton, John Kirby and others set to silent films, cartoons, and live performances." "The entire evening's program -- featuring the music of Raymond Scott and original compositions by Lenny Carlson -- was superb, and the audience was totally engaged, listening to music that was both familiar and unknown performed brilliantly. An exhilarating concert!" "Jeff Sanford's Cartoon Jazz Band is electi-Scott-a-fyin'!! Great re-workings of Raymond Scott tunes, classic jazz turned inside out, stellar musicianship (those charts make my brain hurt) and 'wow' at nearly every turn -- smart, smart, swingin' stuff." "The Cartoon Jazz Concert was terrific! Everyone in the audience was treated to a stellar performance!" Save $10.00 on your order by sharing this event with your friends at checkout!